Los Angeles from March 23-26th, 2017 to offer spiritual discourses and individual blessings to all. “Karunamayi” literally means “compassionate Mother” and she warmly receives all who approach her as her beloved children. The first program will be held Thursday, March 23rd ,7pm to 9pm. 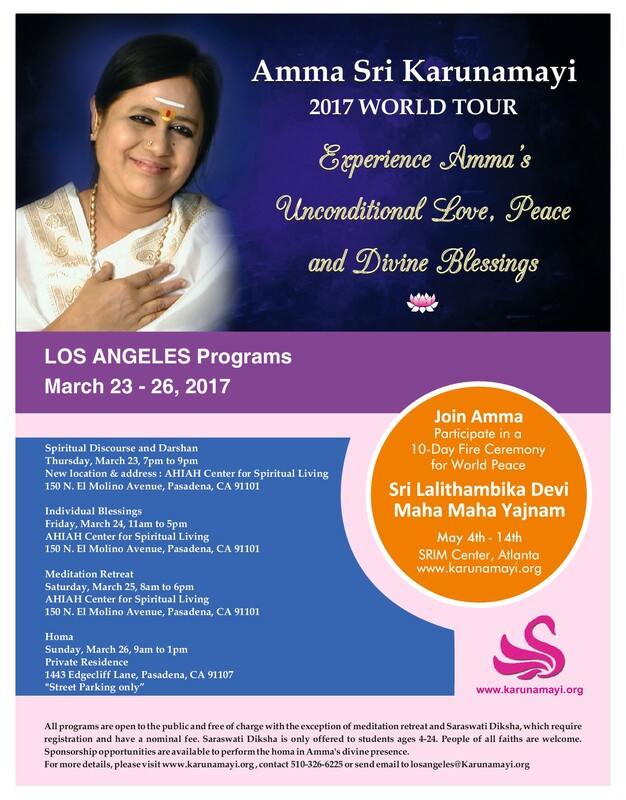 Amma will give a Spiritual Discourse and Darshan. On Friday, March 24th, 11am to 5pm is the Individual Blessings Day. 8 am to approx. 7 pm. Paid registration is required, Early Bird registration ends March 21st. To register, please visit http://www.karunamayi.org. Programs on March 23rd thru 25th will be held at the AHIAH Center for Spiritual Living, at 150 N. El Molino Ave. Pasadena, CA. 91101. For more information, please call 510-326-6225 or LosAngeles@Karunamayi.org or visit http://www.karunamayi.org for other LA program information.